A manufacturer of drug products, including medications for the treatment of rare diseases, required a validated BMS for a key production facility. The facility operates 24/7 and downtime is extremely limited. The customer recognized the need for specific experience in the area of HVAC controls and instrumentation, and this experience was a key requirement for the integration scope. In addition, the customer de-sired a solution based on an industrial automation platform that could easily be maintained, modified, and supported. As this facility produces “orphan drugs,” downtime is extremely costly. As a result, the project schedule was driven by the need for minimal downtime. In addition to extensive factory testing, the installation was managed to execute as much installation scope as possible without intruding into the clean rooms. For example, the new Air Handler Units (AHUs), other work on the roof, and all work in the mechanical areas was completed prior to the shutdown. A detailed plan for work during the shutdown was developed. ACC provided and installed a BMS system for the production areas of this facility. ACC’s scope included the PLC control system, SCADA system, instruments, and electrical installation and wiring, as well as design and test documentation that supported validation. The PLC architecture consisted of a pair of redundant Rockwell Control-Logix PLCs per AHU plus a redundant balance-of-plant ControlLogix, which handled the chillers and other mechanical equipment. 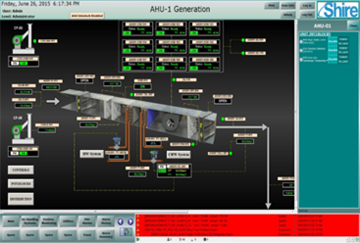 The control system was based on an integrated Rockwell platform including ControlLogix controllers, FactoryTalk ViewSE, and an interface to OSI’s PI Historian. 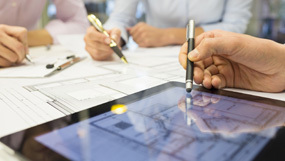 Let’s take a closer look at a few key project execution innovations. Virtually all new field devices were specified, provided, and installed by ACC, including: temperature transmitters (averaging-type and wall-mounted), humidity transmitters, control valves, differential pressure transmitters, damper actuators, and current transmitters.